If this card is Link Summoned: You can target 1 card in your opponent’s Spell & Trap Zone; shuffle it into the Deck. Once per turn, during your Main Phase, if this card was Link Summoned using “Salamangreat Heatleo” as material: You can target 1 face-up monster on the field and 1 monster in your GY; the ATK of the first target becomes equal to the other target's, until the end of this turn. 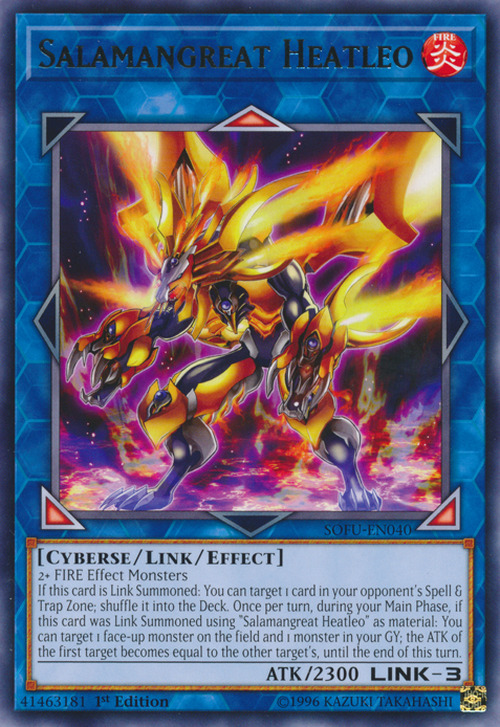 This card's Link Arrows are in the same location as those of Decode Talker, a monster used by Yusaku Fujiki. Fittingly, this card's user, Homura Takeru, is shown to have a connection to Yusaku. This card also has the same Link Rating and ATK, as well as a similar Summoning condition, as Decode Talker. This monster appears in the card artwork of Link Fire's Return, Salamangreat Claw, Salamangreat Roar and Will of the Salamangreat. This monster has an evolved, Fusion form: Salamangreat Violet Chimera. This card's 1st and 2nd artworks depict it as it is when Link Summoned normally, as well as when Reincarnation Link Summoned through the Field Spell, Salamangreat Sanctuary.